The cholesterol content of eggs gives this protein source a bad reputation. However, eggs contain several important nutrients that may actually lower heart disease risk, suggests the Harvard School of Public Health. Consume eggs in moderation to balance their advantages and disadvantages. One whole egg contains about 210 mg of cholesterol, more than half of your cholesterol recommendation for the entire day. One egg also provides nearly 5 g of fat, including 1.6 g of saturated fat. Most of that fat and cholesterol is found in the egg yolks. One egg white contains only 0.06 g of fat, and no saturated fat or cholesterol. Along with cholesterol and saturated fat, egg yolks also provide heart-healthy omega-3 fatty acids, with 100 to 200 mg per yolk. Egg whites contain no omega-3 fatty acids. Despite their cholesterol content, research shows that eating up to one egg per day does not increase the risk of heart disease in healthy people, according to the Harvard School of Public Health. However, data from the Nurses' Health Study and Health Professionals Follow-up Study showed that men and women with diabetes who ate one or more eggs a day had an increased risk of heart disease, notes the Harvard School of Public Health. Diabetics and people with heart disease should limit their consumption of egg yolks to three per week. One egg contains about 71 calories and provides 6.3 g of protein, with 3.6 g in the egg white and 2.7 g in the egg yolk. Egg yolks provide excellent sources of several essential nutrients, including folate, vitamin B-12, vitamin A, vitamin D, vitamin E, vitamin K, choline, calcium, iron and the carotenoids lutein and zeaxanthin. Egg whites also provide small amounts of folate, vitamin B-12, choline, calcium and iron. Eggs can contain a type of bacterium called salmonella known to cause illness in people. Symptoms of salmonella infection include fever, diarrhea and abdominal cramps. Most cases do not require treatment with antibiotics. 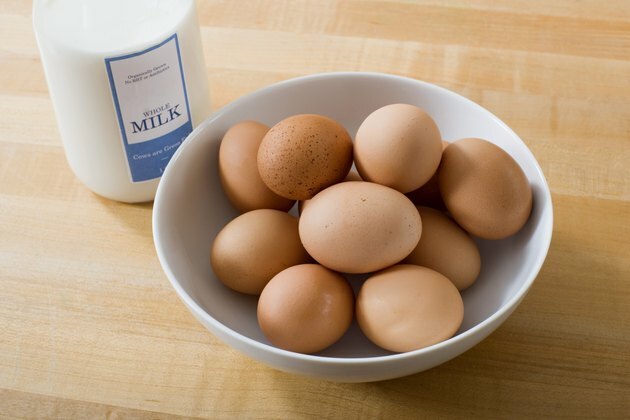 To reduce your risk of a salmonella infection, store eggs in the refrigerator to prevent salmonella bacteria from growing. Cook eggs thoroughly so that both the whites and yolks are firm, and consume them promptly.